Let’s face it; there are doors, and then there are front doors. We may not pay a lot of attention to the doors of the homes and businesses we enter, but sometimes those doors are of such a high quality and so downright beautiful that we cannot help admiring and noticing them as we approach. This is something that gives the property an immediate boost in esthetic appeal and overall value. The materials they are made of are unique or just very beautiful and visually appealing. The style of the doors is noticeable and adds charm, warmth, or beauty to the entrance. The door has been selected carefully to enhance the architectural style of the entrance. As a simple and yet effective example, consider a home that has a rather large front entrance, with a door that is framed on each side with panels of solid wood. This gives the doorway a very closed and solid feel. It may not be the most welcoming doorway possible, and yet replacing it with a wrought iron and glass door would open it up dramatically. Getting coordinating sidelights or panels would also ensure that the entrance was bright and a good match to the overall architectural plan. 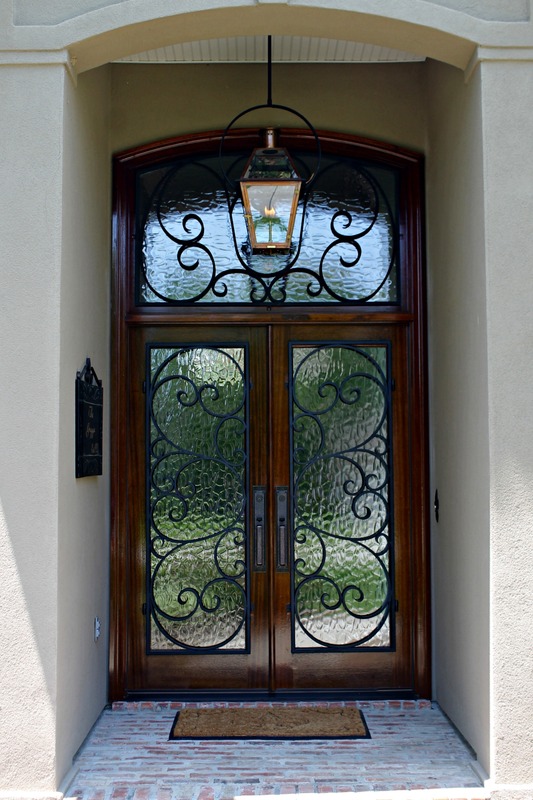 Though we might leap to the conclusion that only grand old houses and homes can benefit from such high quality doors of this kind, the experts disagree and say that your, “Front entry is your home’s ambassador,” and should be as welcoming and attractive as possible. Wood – These provide a huge amount of warmth and will usually be extremely durable and long-wearing. They can also be very easily customized to your specific needs. Mahogany is one of the most elegant and long-lasting, and should be your preferred material. Wrought Iron – Also a good option for a truly customized look, this is a material that adds tremendous elegance and style to your entrance. While it might be used as an outer door, it is perfectly suitable when partnered with glass and wood to create an opulent and remarkably durable door. Fiberglass – More utilitarian than decorative, they can be found in some appealing and custom designs. Obviously, there are substantial differences between these types of materials and the kinds of doors they can be used to create. Naturally, once you know which material is the right one for your home style, it narrows down the options. Even then, you need to know that the quality of the doors will be able to withstand the challenges that all front doors face over time. One of the wisest ways to begin updating your front doors and making sure to have chosen the right materials is to speak with an expert. Whether they offer a gallery of options in a storefront or online, having access to their knowledge is a key step in choosing the right materials. At Doors of Elegance you can discuss your best materials and design choices, make a visit to see the different styles in person, and work with an expert in door design and installation to make the very best decisions. Bandon, Alexandra. 12 Upkeep Ideas to Add Curb Appeal. This Old House, 2015.